THE BANGKOK POST PLC., NOW CELEBRATING ITS 71ST YEAR OF BUSINESS OPERATIONS IN 2017, IS THE PUBLISHER AND DISTRIBUTOR OF THE BANGKOK POST (A DAILY ENGLISH-LANGUAGE NEWSPAPER); POST TODAY (A DAILY THAI-LANGUAGE BUSINESS ORIENTED NEWSPAPER); M2F, A FREE THAI-LANGUAGE DAILY NEWSPAPER, PROVIDING NEWS AND LIFESTYLE FEATURES; AND STUDENT WEEKLY (A WEEKLY ENGLISH-LANGUAGE NEWSPAPER TARGETING PRIMARILY HIGH SCHOOL AND UNIVERSITY STUDENTS TOGETHER WITH OTHER READERS). Through its subsidiaries – Post International Media Co., Ltd., Post-IM Plus Co., Ltd., and the JV Post-ACP Co., Ltd. – the Group publishes, in Thai, and distributes popular international magazine titles, covering business and social news, fashions, home decoration, lifestyle and travel, such as: Elle, Elle Men, Elle Decoration, Science Illustrated, Cycling Plus, Forbes, and Cleo. The Group pioneered M2F, a free daily Thai-language weekday newspaper, distributed directly to urban professional workers and office commuters in Bangkok as well as to key urban cities located in major provinces of Thailand. Mushroom Television Co., Ltd. produces multimedia and video content for television and digital media, both for markets in Thailand and the region. Information services broadcasting and communications, via various subscriber-based digital media platforms and digital mobile device applications, in English and Thai for international and local readers alike, are aimed at making bangkokost.com and posttoday.com the world’s window into Thailand. There are also additional digital media platforms and mobile applications – for office/home PC’s and laptops together with other digital mobile devices that the younger generation of Thai consumers are addicted to – from which various local and global news, and business-related news, together with various lifestyle, and entertainment/food services contents, are available 24/7 to meet the growing Thai ‘urbanised’ lifestyle. Additionally, the M2F job website, in Thai, together with the English-language Bangkok Post Jobs Recruitment display and associated online recruitment portals, are targeting prospective employers and employees. The Group’s book publishing arm, Post Books, publishes best-selling international titles translated into Thai, together with interesting titles in both Thai and English written by our own reporters and columnists or other well-known local authors. Such books cover a wide range of topics of interest, including business and management matters, as well as regional history, regional and local culture and art, and inspirational biographies. The Group’s commercial printing business offers general printing services to various government and business organisations, in addition to serving the Group’s own printing requirements. The Bangkok Post Plc. 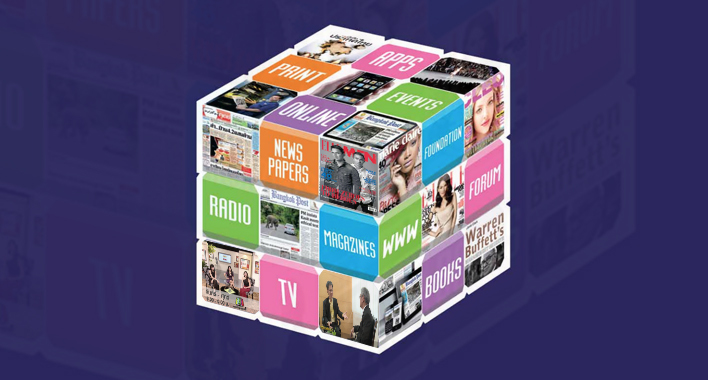 will continuously grow and develop its business activities, including launching other new print and media platforms, products and services together with new titles and ongoing refreshing of its various media platforms and respective presentation formats, so as to continue to be relevant and expand its reach into various existing and new readerships and audience bases. This will enable the Bangkok Post Group to achieve its stated ‘Vision and Mission’ to become and remain the leading multi-media publisher and distributor in Thailand, as well as sustain its position in the Thai media industry as the ‘most trusted source’ of various news and timely features. As such, the Group will continually seek out and acquire new sources of advertising revenues from various fast-emerging new digital media and communications platforms. This diversification of its media and communications businesses will enable the Group to achieve both a more balanced business readership/ audience and revenue base and mix over the next 3-5 years, so as to ensure its ongoing business growth on a sustainable basis.